When your baby's trying to take their first steps, it really helps to have something to give them a leg up. We've all seen little babies attempt to raise themselves up on furniture and walls, and those tentative first steps are so much easier when they've got adequate support. That's why the best baby walker is a must. But you knew that already. You're a smart cookie, and that's why you're here. Read on to learn just what sort of baby walkers you can buy, and what to look for when you're buying one. What Types of Walker Are There? There's actually three types available today, the seated, walking and trailer types. But what are the differences, and which ones are best? Here's the skinny. Seated baby walkers are best for younger babies, because they're going to be sitting in it with their feet hanging out of the bottom. This supports your baby when they can't quite keep themselves upright, but still allows them to scoot around using their hanging feet, like a Flintstones car! Walking frames are better for older babies, because they're more like a zimmer frame, except for toddlers. Most babies are ready to use a walking frame from about six months old. Trailers are the most traditional style, and they're literally a trailer with a standing frame to hold on to. Trailers tend to lack the safety features and versatility more modern styles have, but they age better, because your baby can use them as a toy holder even when they don't need it as support any more. Remember to baby proof the room. When your little one is whizzing around, anything at head height makes them incredibly vulnerable to knocks and bumps. Also bear in mind that your baby is going to have free reign with their hands, whether they're in a seated walked or just letting go of their frame with one hand for a second, so anything that could cause harm if put in their mouths needs to be put away. That means cleaning products, perfumes and alcohol gotta go! Never leave your baby unattended. Kids can move at around one meter per second in a baby walker, so lose attention for one minute and they could literally be out the door and halfway down the street! Don't overdo it. Walkers encourage children to walk, but they don't actually encourage them to get up on their own, so make sure your child spends more time out of the walker than in it. There's a few key things you should search for. Most of these are pretty obvious, but it's so easy to overlook them, especially when you're slightly frazzled from being a new mom! Can It Be Adapted to Grow with Your Baby? Did you know some baby walkers can actually be converted from sit down walkers to stroller types? Even if it can't, it's definitely worth looking at the riding heights, because there's nothing worse than buying one and having your baby outgrow it in a month! So check how many heights it can be adjusted to, and what age of baby it's aimed at. Does It Work as a Feeding Tray or Feeding Chair? A lot of good baby walkers, especially sit down styles, come with a built in tray that's usually adequate to be used as a feeding tray. Some might even recommend it for this use, with cup holders and other bits built in! How Many Activities and Toys Does It Have? You're buying this to help with your baby's development, and the toys and accessories are a huge part of that? The variance here is massive. Some only have a couple of basic toys on them, others have removable panels that function as really impressive toys just by themselves. So double check and see what you're buying! How Stable and Safe Is It? All good baby walkers have to pass safety standards, and if yours doesn't then seriously, don't buy it! However, there's a lot of other things that a walker can include which add to safety, like built in brakes and stability sections. We both know just how messy things can get with a toddler rolling around the place, and if they're using a walker every day, especially to eat, then it's definitely worth making sure that you can clean it quickly and easily. The best walkers are machine washable, and might even come apart so you can clean them even easier! Kolcraft's tiny steps walker is a really impressive little walker with everything your baby needs to take them from only being able to sit up on their own, all the way to toddling around unsupported! For starters, this can be fully converted from a sit down type, to a stroller frame type really simply. So that means it grows with baby, all the way through their development. It's also easily adjustable for different heights and weights, so no matter how big or small your baby is, they're going to fit into this. It's comfy, with a soft padded seat that's easy to clean, and the built in tray and cup holder means this can also do double duty come dinner time. The built in developmental toys are basic but well made and lovely, with a bead bar, spinning ball and textured flower. It's safe, too. The bumper bar around the edge is wide set, to protect your child's feet, and the built in anti slip friction pads mean that no matter what surface you put this on, it's not going to go anywhere it shouldn't, even on hardwood flooring. Finally, you can fold this away into a tiny storage shape, which slips into any cupboard or behind the couch, so when it's not in use you don't have to keep looking at it, stuck in the corner. All this, and it's also really reasonably priced. If you don't know what sort of baby walker to buy, and you need something that's going to carry your baby all the way through their learning to walk years, this is a really nice choice. Very engaging for the little one! When you think about baby walkers, you probably think about this one. It's ubiquitous, seen in every nursery and playground ever, and there's a reason the design is so popular. Because it's great! It's a frame style walker, which are obviously really simple designs, but that doesn't mean it's worse than other styles. It's strong and sturdy, and has a really smart tension control dial so you can set how fast your little baby can move it. When you're looking at this walker, though, the real focus is the toys. There's so much on this that it's guaranteed to quickly become your baby's favorite toy. Which is great, because you can easily remove the toy section too, so your baby can easily use it away from the walker, even when they no longer need it! With the standard rollers, shape sorters and light up buttons, your baby gets everything they need to help develop key motor skills, and the 5 musical piano keys and over 70 songs and sound effects are a huge help when it comes to linguistic progress. It's also got two separate modes, learning and music, designed to help your baby with two different modes that have specific effects for your child. All this, and it only needs 2 AA batteries, which it actually comes with! If you want great toys, as well as being a solid and stable walker for your baby, then you know which one to get. V-tech know what they're doing. Let their expertise help your baby, like they're helped so many others. A great budget choice with a really nice selection of toys, this baby walker is my favorite seated walker out of the list, and an excellent choice overall. Here's why. First, the toys. They're really impressive, especially for a lower priced walker. Electronic, with lights, sounds and melodies, they're sure to keep your child entertained, which is great because you can pull the toy section out of the walker and use it on its own too. Plus, even though it uses batteries, it only needs 3 AA's, and doesn't go through them too fast either. The baby walker itself is surprisingly well built, with a really sturdy construction, deep seat and strong bumper frame. There's a surprisingly smart safety brake feature in the wheels, too, which automatically puts a stop to movement when the walker goes over uneven ground. Theoretically, this means steps aren't going to cause accidents. But we still don't recommend you put it to the test! It also grows with baby. The seat is large, with 3 adjustable heights. Plus, when you're not using it, it folds down to a slimline flat form that you can throw under couches, cribs or into cupboards. Overall, for the money, this is a really solid little walker, and definitely worth considering! 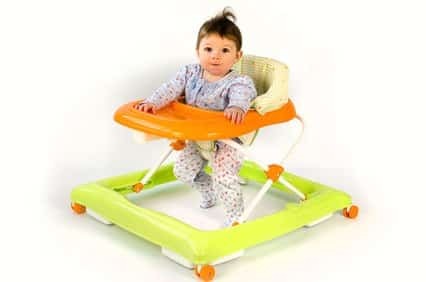 A simple sit down style baby walker with a great selection of toys, Safety 1st's offering is a great budget choice that just needs a little more thought if you're picking it up. Actually putting it together can be a little annoying, but once you've got it assembled it's a great little walker, with a really sturdy build, a wide bottom bumper and grip strips that keep it stable whilst letting it move even on thick pile carpets! The toys are really good on this, too. There's a great selection, and they're built into two sliding trays that sit over another tray that's perfect for dinner times. It's easy to wash, too, considering you can just throw all the fabrics into the washer. Which is nice, because we all know how messy it can get when your little one gets into their food! The only real issue? It's got three adjustable height settings, but even on the lowest setting, it sits quite high. So smaller babies might be hanging from the floor a little when you first buy this, which obviously isn't ideal. So if you've got a petite child, take another look at this and make sure they're going to be able to use it before you buy. 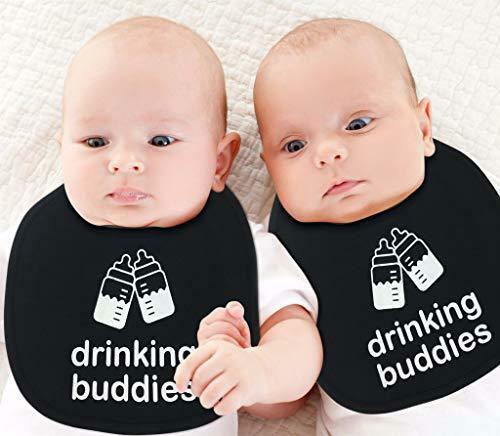 There's an awful lot of options out there, but as long as you buy something that your baby can easily walk in, and that has enough stimulation to keep them interested, you're sure to make the right choice. If you have an alternate best baby walker in mind, please let us know in the comments.